Sessions! Are there godly young men in your congregation between the ages of 16 and 21 whom you would like to see consider the gospel ministry? If so, nominate them to attend the OPC Timothy Conference, held April 11–14, 2018 at Bethel Presbyterian Church in Wheaton, Illinois. 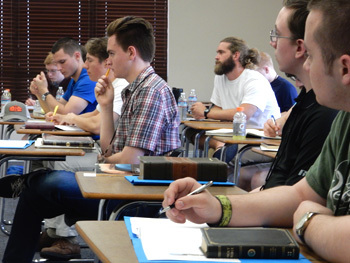 A decade ago, the OPC's Committee on Christian Education developed the Timothy Conference as a way to challenge godly young men to the gospel ministry. Caleb Smith, a college sophomore from San Antonio, Texas, came to that first conference. In 2016, Caleb was the first out of approximately 150 Timothy attendees to become ordained. Now, he serves as associate pastor of Calvary OPC, Glenside, Pennsylvania. Perhaps a communicant member from your congregation also should consider the ministry. Enrollment is limited, so if you have a late high school or early college man with a heart to serve the Lord, nominate him before the January 15, 2018 deadline. The young men will learn from five experienced pastors what the ministerial office entails and receive guidance on considering a call to the ministry. They will see the importance of receiving a Reformed seminary education and be given specific ways to prepare for future ministry, including the path to ordination in the Orthodox Presbyterian Church. Attendees also will receive a taste of seminary by sitting in on classes at Mid-America Reformed Seminary in Dyer, Indiana. Speakers include the Rev. Dr. A. Craig Troxel, pastor of Bethel OPC and adjunct professor at Westminster Theology Seminary and Mid-America; the Rev. Benjamin Snodgrass, pastor of Falls OPC in Menomonee Falls, Wisconsin; the Rev. Dr. David VanDrunen, professor at Westminster Seminary California; the Rev. Jim Megchelsen, pastor of Grace OPC, Elburn, Illinois; and the Rev. Danny Olinger, CCE general secretary. The CCE pays all of the attendees’ costs for the conference, including travel expenses to Chicago, food, lodging, and local transportation. The young men, however, must express a willingness to attend, despite a possible need to adjust their academic schedule. The CCE's Subcommittee on Ministerial Training will consider the nominations and notify sessions of their decisions no later than January 20, 2018. The application can be downloaded from the Timothy Conference page.